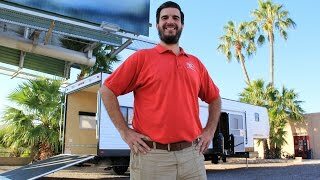 View our video gallery of custom Fifth Wheel toy haulers below. We are continuously adding or updating to provide you current walk-through videos, and pushing to bring you various videos from inside and outside our custom trailers. Dune Sport offers 5th Wheel Toy Haulers starting at 22 feet and go up to the legal limit of 45 ft. The most obvious benefit of building a custom Fifth Wheel Toy Hauler is simply because people enjoy the increased open feeling inside and the much added space for numerous toys and small off road vehicles. Get started today by choosing from our many options and building your custom Fifth Wheel Toy Hauler online. How exciting! We successfully added you to our list. Now enjoy incredible savings and news updates sent to your email. We apologize, we could not add you to our list. Its easy. Instant deals. Huge savings! Check out videos for more on our Toy Haulers and selection of Used Motorhomes.